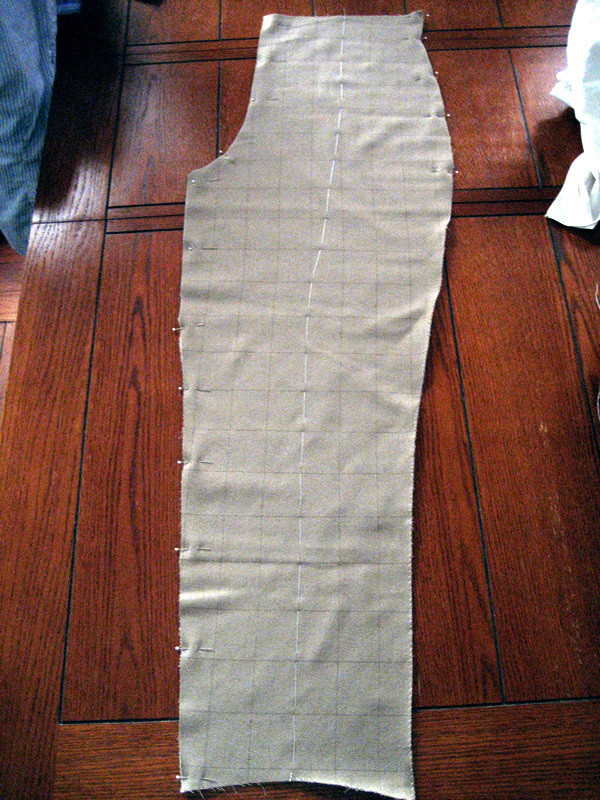 After test-fitting my muslin, I cut out my wool fabric. 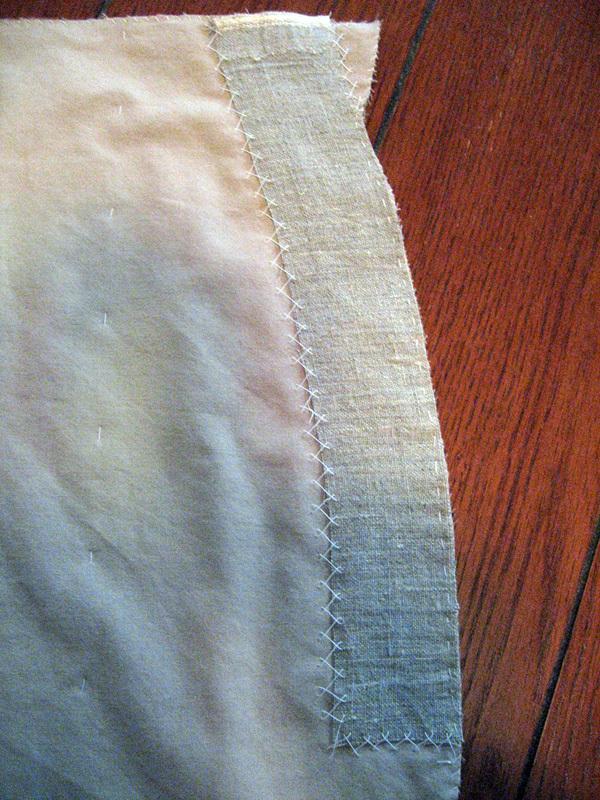 Even though the muslin seemed to fit just fine I was going to add some insets (extra seam allowance) but I forgot to. Well, hope that works out for me. 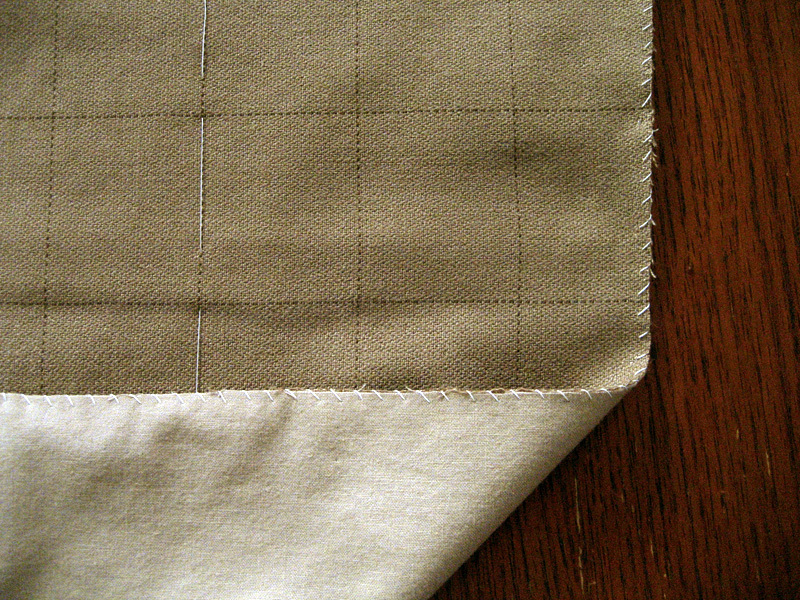 I'd found a great wool fabric for a great price that I wanted to use for these trousers. The only problem was it was a modern suiting weight, and this sort of trousers should really be a bit heavier. I decided to interline the wool with cotton which will not only give it the drape that I want but also make them a little more comfortable to wear. Don't get me wrong - I wear wool trousers all the time and love them, but sometimes at the end of the day I take them off and just scratch my legs a bit. Here I've basted the two layers along the centre line, and have begun to serge the edges together. Since I was planning on serging the edges of the wool anyway, this isn't really going to add any time to the process. You can see the two layers. I think this is the best indication of the colour of the wool I chose. I tried to adjust the images but this one came out the best. The next step was to prepare the canvas stays. You can see here that I had a few tries at drawing out the fork (crotch) stays. And some more drawing of fork stays. In the end I actually ended up using one of the white chalk ones instead of my "final" decisive black chalk one. I basted in the fork stay and then cross stitched it in place. I've also seen the term "catch stitch" for this. 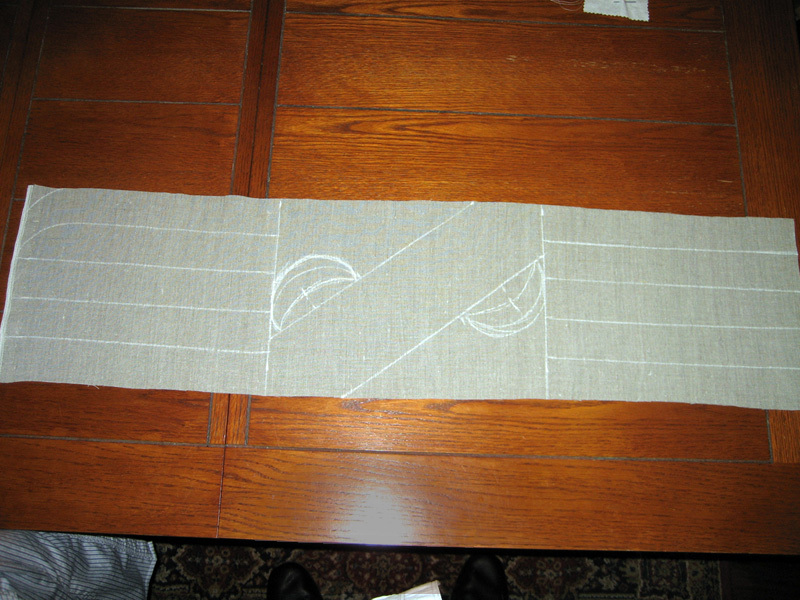 I'd worried about this when I decided to interline the trousers, but the lining made it a little more difficult to pick up a few threads of the wool with the cross stitch. 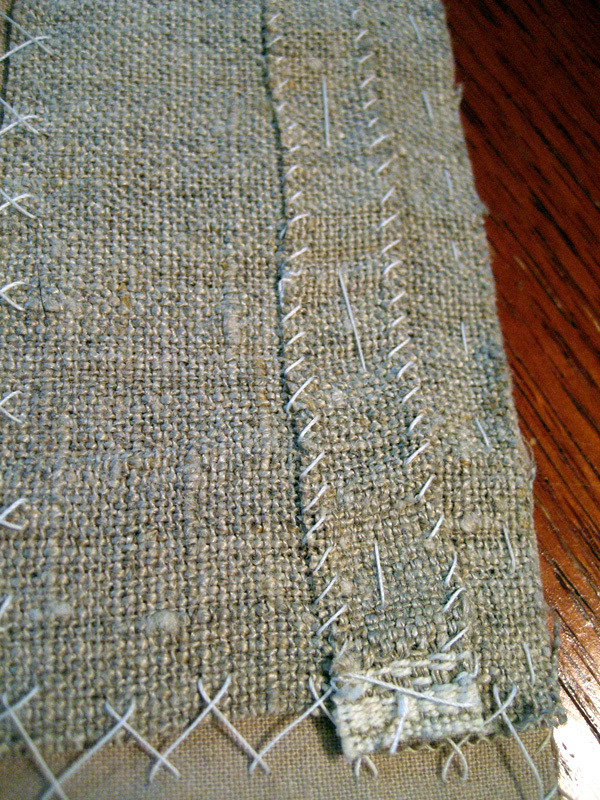 If you're not familiar with this stitch, it shouldn't show at all on the right side of the fabric. I didn't get a picture, but I succeeded in catching a few threads of the weave from the back of the wool. 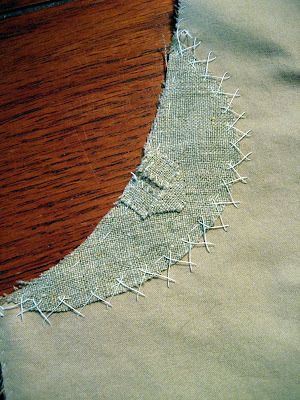 I just had to jimmy the needle around a bit and try a few times on some of the stitches. 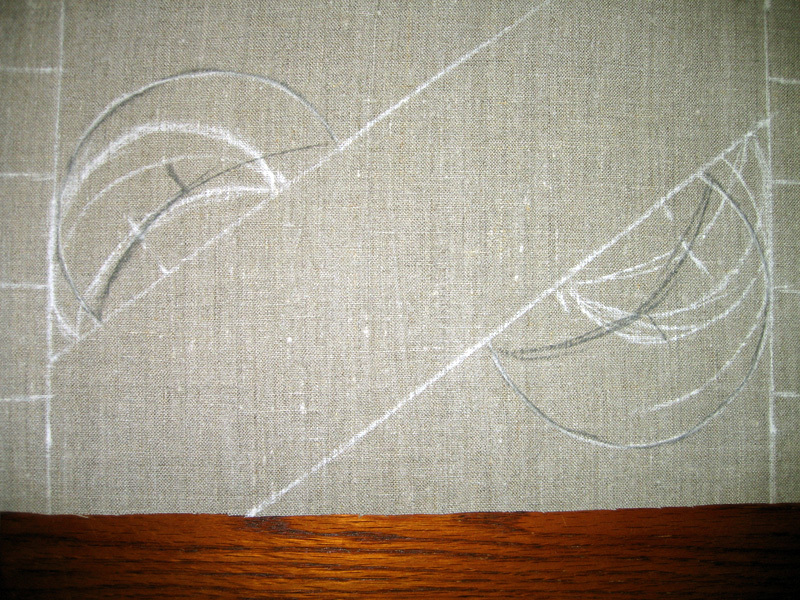 The fork line reinforced with another layer of linen canvas tape. I'm going to clip the notch in the middle of the tape, and this will hold it steady. 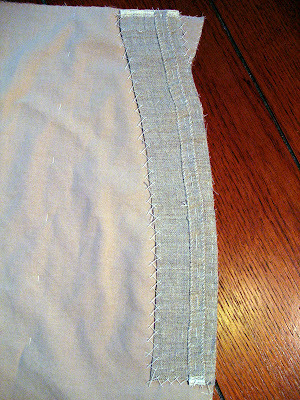 The pocket stay in place. 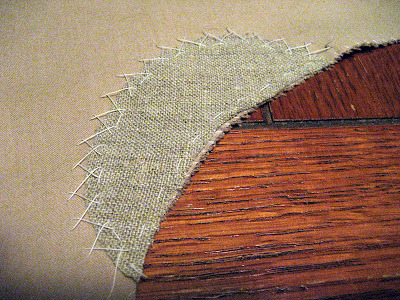 Once again I cross stitched it along the inside edges, and basted it in place along the hem (raw) edge. An extra piece of tape to reinforce the pocket opening. In retrospect I should have used a lighter weight of linen instead of this canvas. I hope it won't be too much fabric when I turn the hem in. A close-up of the stay tape and the pocket stay. 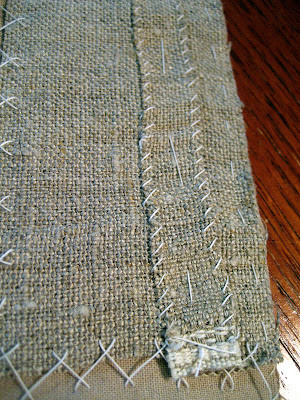 The basting is still in the stay tape, and I'll probably leave it in until I finish the trousers.